Every business needs to have a professionally designed online presence these days. That very much applies to independent lawyers, law businesses, and other legal websites. 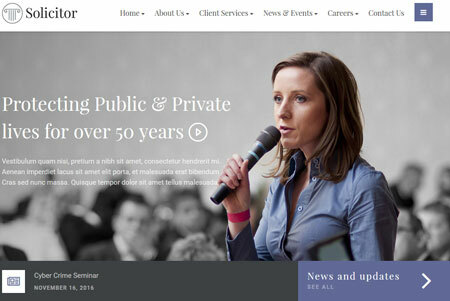 Solicitor for WordPress is a commercial theme based on Bootstrap that gives your existing site an attractive makeover. It has wide & boxed layouts, 12 preset color schemes, a responsive design, and a drag & drop homepage builder. Solicitor has a built-in mega menu system and Retina ready icons. It supports unlimited colors and comes integrated with WooCommerce. Users will have the option to create unlimited events and handle recurring ones. Paid and free tickets are supported. Thanks to Page Builder by SiteOrigin, you will be able to create dynamic pages. 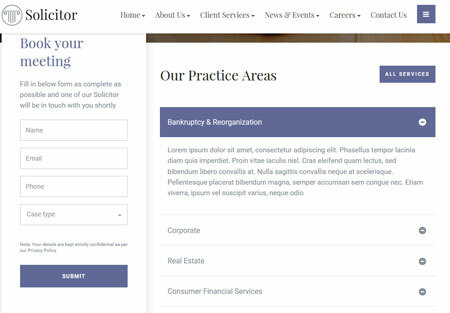 Solicitor comes with a custom theme options panel to make changes to logo, content width, and other settings. Theme options data can be easily imported/exported.